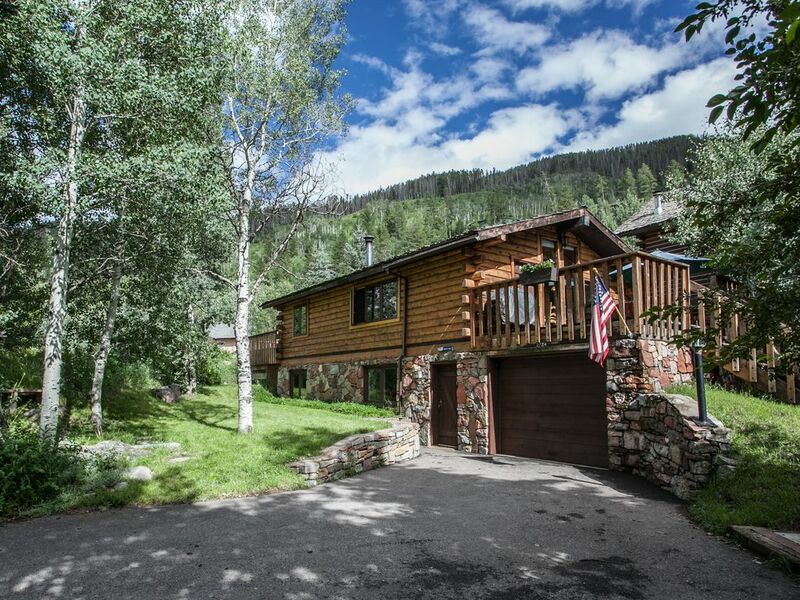 The LARKSPUR LODGE is a single family home located in one of Vail's most scenic neighborhoods. Enjoy the views from this beautiful log cabin with an open floor plan, private 7 person hot tub on its own deck, four bedrooms, two baths, one car garage, wood stove, and WIFI. Located in the heart of West Vail, 150 feet from the free Town of Vail bus stop, no car is needed for you to get to and from Vail Village and the slopes. This recently updated, family-owned vacation home is not part of a rental pool and is used primarily by our family as a second home. You will deal with the owners directly instead of with an uncaring rental agency. Alpine and Nordic skiing, snowshoeing, ice skating, hiking, biking, golf,fly fishing, and tennis are all nearby as is the newly renovated Gerald Ford Amphitheater. Stephen's Park and playground is less than a 5 minute walk down the road. Once you arrive there is no need to drive. Leave your car in the garage and walk 150 feet to the bus stop for the free, ten minute ride to the Heart of Vail Village. Or, walk, roller blade or ride your bike into town on the beautiful bike path that runs alongside Gore Creek. This property is a one of a kind property in Vail. Being a single family home on it's own lot gives you privacy and plenty of parking. This is a true log cabin and most of the cabins in Vail have been gone a long time and condos have taken there place. The location and charm make this home special! During your stay in Vail, we can help you plan your vacation with everything you'll need from tips on dining out to getting 10% off on all rental equipment. We are long time locals who can help make your trip more enjoyable! Natural gas baseboard and in-floor radiant heating. Small wood burning standing fireplace. Wood not supplied. Stainless steel and granite counter tops. Two mountain bikes upon request. Ground floor has large door and no sitars. Private 7 man Hot Springs hot tub on back deck. Very private. Fly Fishing out your door, Outdoor Ampitheater, Ice skating and plenty of biking and hiking trails.